Are Smartphones Outsmarting Your Network Security Perimeter? 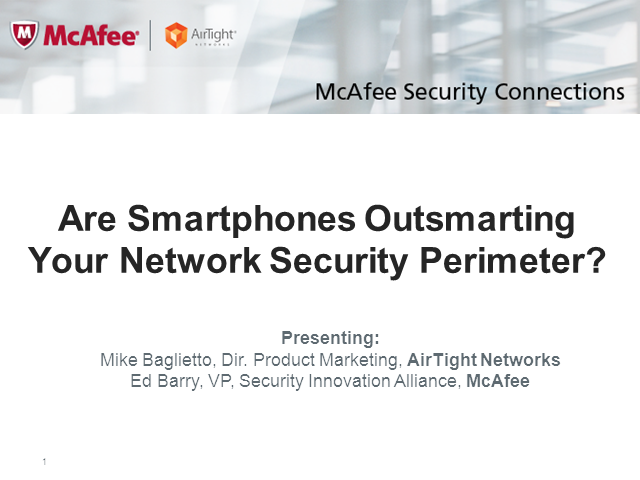 In this Webinar, AirTight Networks will discuss strategies you can use today to manage unauthorized smartphone access on your network. The combination of McAfee Mobile Data Management, McAfee ePO, and AirTight’s wireless intrusion prevention system (WIPS) provides network administrators with full visibility and automated remediation of wireless threats and data leakage. Title: Are Smartphones Outsmarting Your Network Security Perimeter?